With its smooth, clean silhouette, Pinstripe Pure evokes a sense of relaxed luxury and vintage 1930s American style. This bath faucet trim features soft, clean edges along the faucet and ergonomic cross handles. When paired with high-flow ceramic disc valves, this trim offers optimal performance. From finishes that are guaranteed to last a lifetime, to faucets that perfectly balance your water pressure. MOEN sets the standard for exceptional beauty and reliable, innovative design. This valve is metal construction. Victorian 3-Handle Tub Wall Claw Foot Tub Faucet with Hand shower in Oil Rubbed Bronze Bring a modern style with a nostalgic feel to your claw foot tub. Featuring an elegant wide spout, this faucet will look great in any bathtub. Solid brass construction for durability and reliability and a hand held shower. 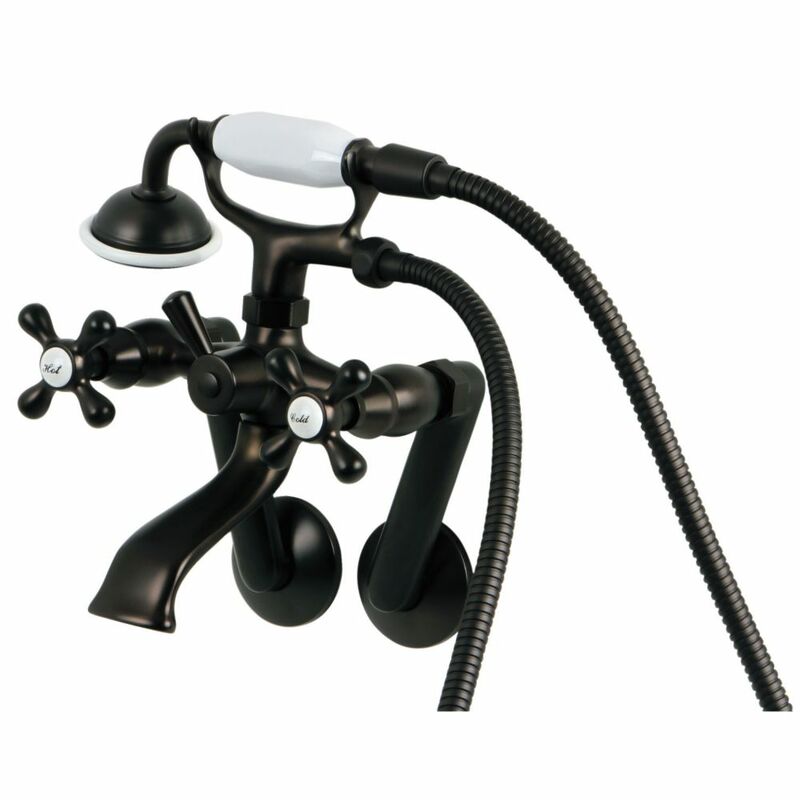 Victorian 3-Handle Tub Wall Claw Foot Tub Faucet with Hand shower in Oil Rubbed Bronze is rated 3.7 out of 5 by 10. Rated 5 out of 5 by hector from Well-made, american product. Well-made, american product. Rated 5 out of 5 by Douglas from Never heard of this brand and started to buy another... Never heard of this brand and started to buy another more expensive well known brand. The quality of this faucet was excellent and I am very happy with it. Easy installation. Rated 1 out of 5 by Adam from For some reason that nobody was able to identify, this... For some reason that nobody was able to identify, this was returned to sender, at the senders request, before it got to me. When it finally did arrive, it was missing pieces which I had to order directly from the manufacturer and, of course, wait for them in the mail.